Financial market regulations have become one of the cornerstones of public debate since the recent bursting bubble in the US subprime market and the following global financial and economic crisis. It is the subjective feeling of many people in our society today that the financial market players act very autonomously and do not have to adhere to so many regulations. On the opposite, different authors such as e.g. Lawrence J. Wright have argued in the past that the financial sector is one of the most heavily regulated industries– even though public opinion seems to oppose such statements (1997, p. 1). Nevertheless, since this statement has been published, a lot of things changed especially in the U.S. This essay shall not provide a general overview on financial regulations. Instead, a more profound discussion on financial innovations shall be delivered with the practical example of High Frequency Trading (HFT), a follow-up innovation of Algorithmic trading (AT). This will then be put in the context of regulatory regimes and efforts. This paper shall therefore be structured as follows: firstly, a definition of the term “innovation” will be presented which is followed by a localization of it into the financial market. Secondly, the issue of regulations with a focus on the institutions that have the authority to regulate within that sector will be discussed. Thirdly, the practical example of HFT will be described. Also, a demonstration of positive and negative effects of such an innovation shall be given. 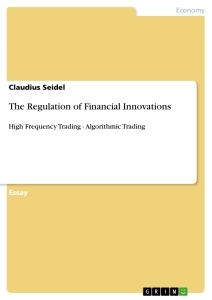 The fourth part will provide a short overview on attempts to regulate the innovation HFT. Finally, a conclusion will be drawn in order to provide the reader with stimulation for further thinking and discussion on the topic of regulating financial innovations. First, it is important to define the term innovation. According to Barnett, “an innovation is […] any thought, behavior or thing that is new because it is qualitatively different from existing forms” (1953, p. 7). Also, as Rogers has described it: innovation is “an idea, practice or object that is perceived as new by an individual or other unit of adoption” (1983, p. 12) and describes a process, which leads from invention to exploitation (1987, p.3). Hence, three aspects can be taken into account in order to identify innovations. Also, a further distinction must be named in this respect: innovations can be differentiated whether they are product, service, process, input or organizational ones. Nevertheless, innovations can sometimes also belong to different categories at the same time, a fact that will come up again in the attempt to localize HFT within the financial innovation sector. With regard to financial innovations, there are no clear-cut definitions available that can be named here. Nevertheless, within the financial sector, one can mainly find product and process innovations such as derivatives for the former or Internet broking for the latter. More theoretically, based on Lancaster’s theory of demand for characteristics, Dufey argues that financial innovations constitute a simple “unbundling and repackaging” of existing products (2003, p. 9). Other academics have framed it more pragmatically, that financial innovations come into existence as a counteraction to constraints and exposures in the system (ibid.). Bearing this in mind, it seems more suitable to identify AT/HFT as more fitting to a classic innovation due to developments in other sectors. More specifically, the past few decades have produced drastic developments in information and communication technologies (ICT) which made many of the service or process innovations existing today possible. However, this is not to say that these are completely new developments. Looking back in time, it was already in the 1840s that the development of the telegraph led to the use of “wire transfers of funds […] with respect to gold and securities that were traded on various exchanges, nationally and internationally” (Lawrence, 1997, p. 6). Nonetheless, a nearly evolutionary progress has started within the past fifty years and is still happening due to the availability of high performance computer systems and less costly and more powerful ICT. Günter Dufey emphasizes here that these developments have mainly fostered the so-called internationalization and interrelatedness of financial markets (2003, p. 6). Regulation is broadly defined as imposition of rules by government, backed by the use of penalties that are intended specifically to modify the economic behavior of individuals and firms in the private sector. When it comes to the question of regulation, it is difficult to assess whether we can speak of a regulatory regime or authority. In general, it is the national authorities that regulate the financial market, most evidently when it comes to taxation issues. In the case of Germany, it is the Bundesanstalt für Finanzdienstleistungsaufsicht BaFin. Here, the controlling of the financial institutions that are located within German territory is being carried out: 1.900 banks, 717 financial service institutions, 600 Insurance companies and about 6.000 funds as well as 73 investment companies are currently under their auspices (BaFin, 2011). One of the main tasks of the BaFin is to ensure the transparency of stock markets (e. g. prevent insider trading) as well as the control of all (German) companies listed on the stock market. On the European level, there are no specific regulating institutions existing when it comes to the e. g. approval of financial innovations. Although the European Central Bank ECB and the European System of National Banks ESCB have a coordinating function, these institutions do not possess regulatory power (ECB, 2011). Additionally, there is the European Banking Authority EBA that has taken over the tasks and duties of the Committee of European Banking Supervisors CEBS: “The EBA has some quite broad competences, including preventing regulatory arbitrage, guaranteeing a level playing field, strengthening international supervisory coordination, promoting supervisory convergence and providing advice to the EU institutions in the areas of banking, payments and e-money regulation as well as on issues related to corporate governance, auditing and financial reporting” (EBA, 2011). With regard to the European Commission, it is often, due to the cross-cutting nature of financial issues in political terms, an interplay between different Directorates-General (DG). In particular, the Directorate General for Economic and Finance DG ECFIN is mostly the first addressee together with the Commissioner for the internal market when it comes to regulations, though e. g. DG Justice is in most cases concerned with it as well. However, the newly created European Security and Market Authority ESMA is an instance that shall, equipped with basically the same goals as the German national supervisory authority BaFin, ensure the financial security and stability through the identification of potential risks in that sector and enhance the international supervisory cooperation. This institution was created in the aftermath of the global financial crisis when activism in the European political sphere regarding financial instability was at its peak (ESMA, 2011, p. 3). Finally, the global level is reached when it comes to the Group of Twenty G20: On this level- with regard to financial innovations through technological developments- a request to the International Office of Securities Commissions IOSCO has been recently issued. IOSCO is asked to formulate policy advices to reduce the risks of e. g. HFT and increase the transparency and integrity of it (BaFin, 2010, p. 70). However, this is not to say that the G20 constitute a regulation authority. It is better to speak of a group that sees financial stability as one of the main goals, nonetheless more in functional terms. Therefore the request by G20 is more suitable to be named as a lowest possible denominator on which national (or in the case of EU zone: European) authorities can rely by introducing regulations. The innovation High Frequency Trading HFT, a sub-class of Algorithmic Trading AT, has been entering the core of discussions on transparency and integrity within the financial market since the so-called “Flash Crash” of the New York Stock Exchange NYSE on 6th of May, 2010. It was on that day, that a tremendous downturn in stock prices happened where the NYSE index fell 9 per cent temporarily and recovered within minutes, but still remained 3.3 per cent (appr. 1.000 index points) lower at close of the exchange (BaFin, 2010, p. 69). In other words, 1.000 points losses equal around $800 billion, the sum that has been at least virtually destroyed within minutes (Lochmaier, 2010). Interestingly, the examination of the facts by the U.S. Security and Exchange Commission SEC did neither find any proof that HFT had provoked this downturn nor that it was not responsible for it. Particularly the possible cumulative power that HFT has in the context of crisis situations on the financial market could not be excluded at all (BaFin, 2010, p. 70). The SEC report only demonstrated that one single transaction of a future contract that was led by AT/HFT had provoked a general negative trend on that day (Lochmaier, 2010). Critique on that very report came from e. g. the Financial Times newspaper, which argued that the report is inconsistent and shows some investigative gaps (ibid.). So, the question remains what these AT/HFT systems are and how regulatory bodies can approach the issue. Algorithms typically determine the timing, price, quantity, and routing of orders, dynamically monitoring market conditions across different securities and trading venues, reducing market impact by optimally and sometimes randomly breaking large orders into smaller pieces, and closely tracking benchmarks such as the volume-weighted average price (VWAP) over the execution interval. As they pursue a desired position, these algorithms often use a mix of active and passive strategies, employing both limit orders and marketable orders. So, in a more accessible language: AT describes the systematic use of mathematical formulas, employed in computer programs for various purposes, but ultimately leading to the same end goal: to support and somehow replace the human trader (“floor trader”) with computer-based multi-channeled programs/systems. The task of the trader is reduced to three aspects through the application of AT/HFT: monitoring the system, checking the statistics and making sure that the situation has not changed. In a nutshell, AT is about the sell-side as well as about the buy-side in the market and therewith, an all-encompassing construct that is used more and more by financial intermediaries (cf. Gomolka, 2010, p. 7). This is further underlined by a figure provided for by Deutsche Börse AG: the usage of AT on the electronic trading platform XETRA has accounted for 43% of the total trading volume in 2008 and is growing further (p. 24).